What is your favorite part of decorating? I sure know what mine is! I like coordinating colors and textures, carefully choosing furniture, finding art for walls… but I love love love accessorizing decor. I am wild about creating vignettes, picking out accent decorations, hunting for that one perfect statement piece that will bring my personality into a room! I am the self appointed Embellishment Queen. I love to make things pretty! 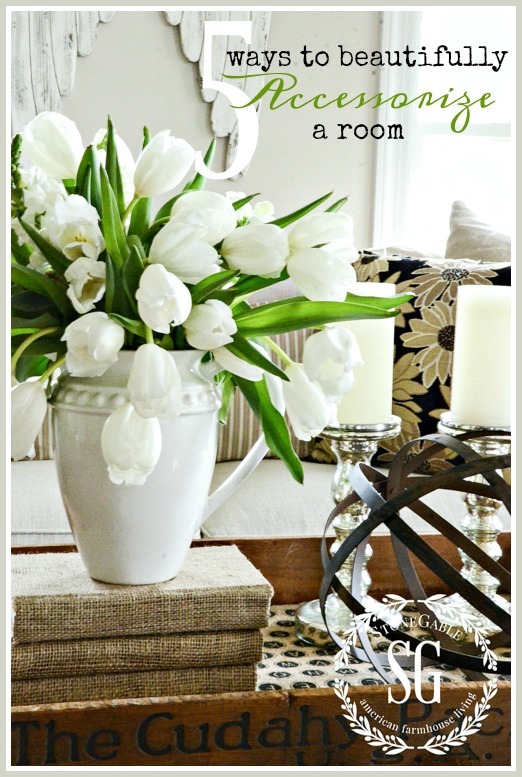 I bet you like that too, so here are 5 ways to beautifully accessorize a room. 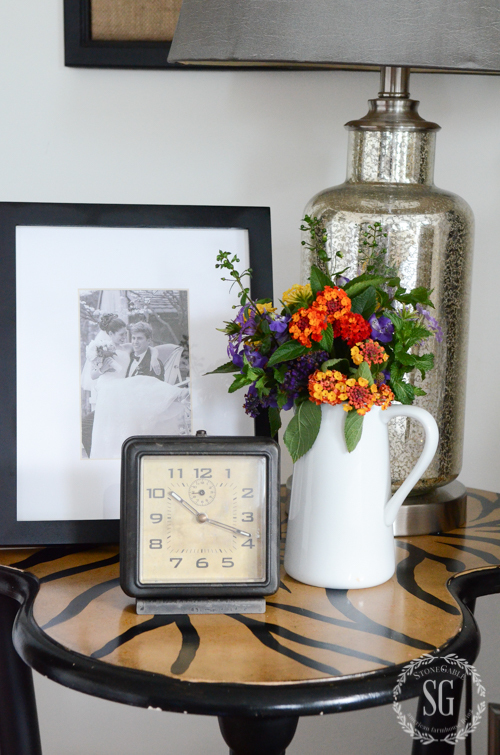 My number one rule is… DO NOT accessorize a room with too many little things. A few or even several are okay, especially if they are grouped together. They can add detail to a vignette or a stack of books or a basket, but too many little decorations scattered about can end up looking like clutter. A trio of smaller items can look quite charming together on a little table or a stool or tucked into a corner. Just don’t over do the amount of small grouping of small things in one room! The bigger the piece of furniture the bigger the accessories should be! I love accessorizing with bigger pieces. A large urn, huge lantern, weather vane or a couple of topiaries! When adding those finishing elements to a room we still want the room to shine and the trimming we add to it to work with the rest of the room. Think BIG when accessorizing! Make a statement! 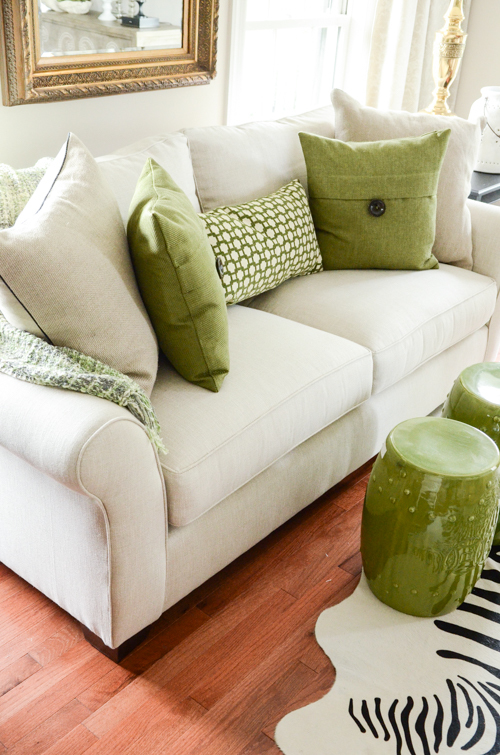 Accessorizing your home is all about letting YOUR personality shine through in your decor! Use what you love! I think I like embellishing and accessorizing so much because I can build a layer of decor that is personal and creatively mine! A friend came to my home not long ago and asked why my home always seems so inviting? Thank goodness she came on a day when almost everything was in order!!!!!! She went on to say that she could see so much of me in my decor. Wow, I thrilled! It’s that layer of embellishing and accessorizing that works magic and lets your personality shine! I think my home reflects who I am and my philosophy about my home. Layer, layer, layer! 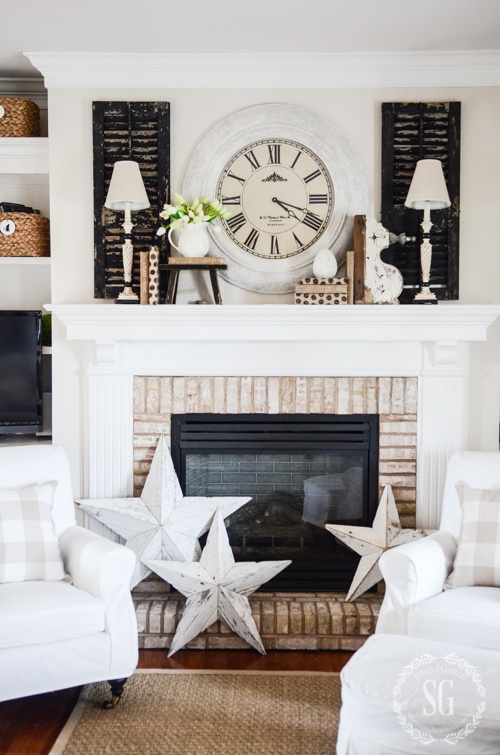 Layering decor is another way to beautifully accessorize your home! It can be a bit of an art and most of us need to spend a little time working on it to achieve a pleasing-to-the-eye look! Layering accessories must LOOK effortless, but it’s not at all! Accessories should be all about bringing interest, beauty and even function into a room. Think about textures, heights, materials, balance, and size when layering and embellishing. Use something organic too! 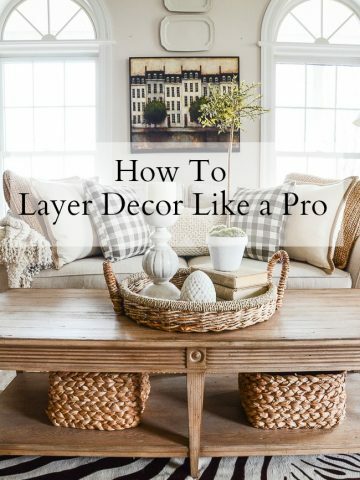 All the decor layers you add to your home should (I said this before) work together! Think of layering as “playing with what you have”. Play with decor in your home that you love and think might work well together. Accessorize an area, stand back and look at it. Edit and add and change things up. I often have to walk away from something I’m working on and come back to it later with a “fresh eye”. Layering is so worth the effort and time it takes to get it right! 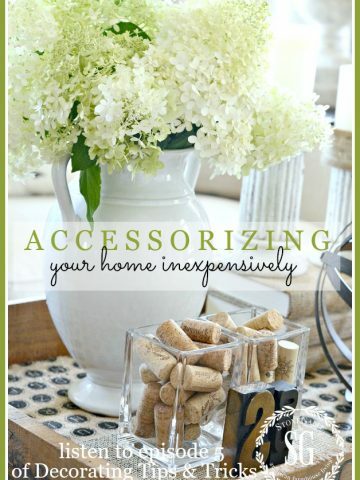 Another one of my favorite ways to accessorize is to create a fabulous vignette! I love to group things together (big and small and in between) in a basket, tray or crate. The synergy of a vignette like this makes one big decor statement. 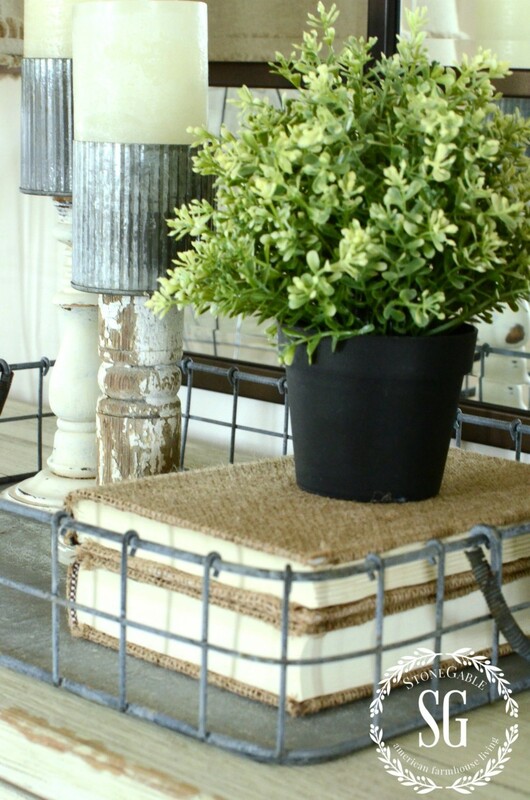 The same elements and rules used in layering also apply to a vignette. A vignette is a grouping of items corralled together to make one big eye-pleasing (said that before too) decorative “story”. 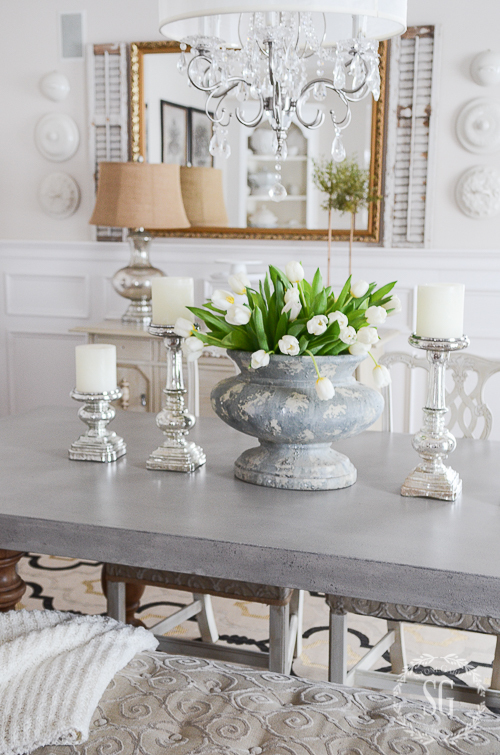 Even a kitchen table can look beautiful with a vignette made from its wares! I may have left the best for last. Pillows are like jewelry to a room! Think of them as little gems that add amazing beauty of a room! 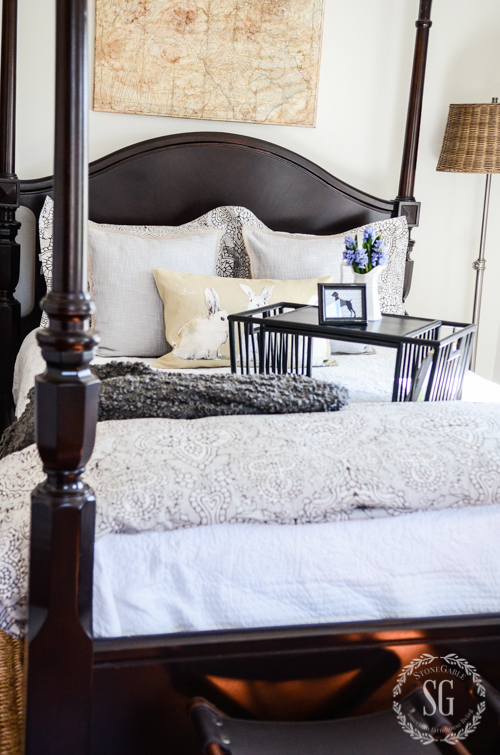 A room just does not seem complete without some well chosen pillows! I love that I can change up pillows so easily! They can totally change the look of the entire room! Same sofa, same mirror, same lamp, same anchor pillows and rug as above, but very different look! 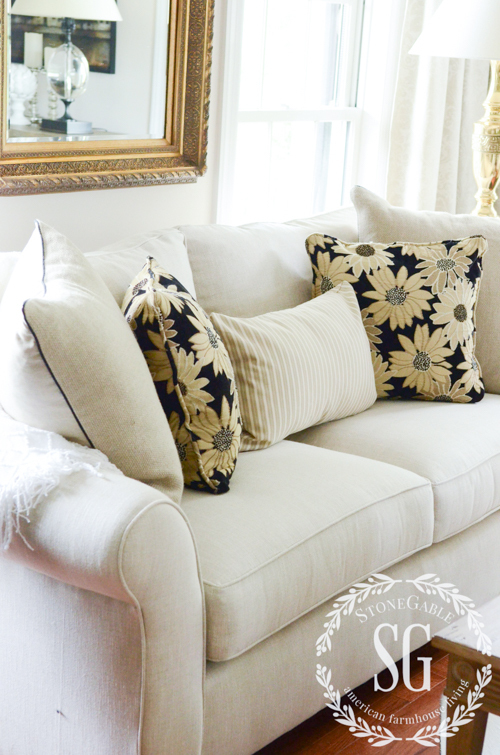 When you accessorize your next room, start with the pillows! 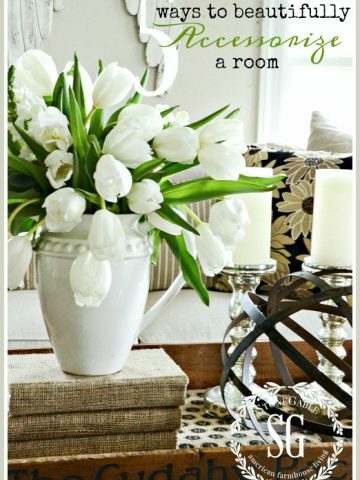 Do you have a tip for accessorizing the rooms in your home? Please share, we would love to hear about it! You might also like to follow me in Pinterest and see what I am finding to pin HERE. Your tips are so badly needed. I look at all these beautiful decor in home magazines and time after time I fail when I try to style my on home. I now realize its the small touches that gives it that designer and personal touch. Thank you and looking fwd to your emails. I like the tip about staying away from too many little accessories. We are trying to make my sister’s bedroom look less cluttered. I think this is one of her main problems. I am going to share this tip with her. I agree with some previous post about storage, Yvonne please share with us how you organize and store. You have shared how you store your pillow cover collection and that was a great help, now with the rest of your vignettes and holidays. Yvonne, for nearly a year I’ve been looking for throw pillows like the ones pictures on your family room sofa in the picture where you have the topiaries on the coffee table but have had no luck. Do you remember where you got them? I’m love them and the color looks perfect for my sofa! Thanks very much! I love to change things up too, Elizabeth! I love your kitchen vignette, with the blue and white dishes and gorgeous blue and white drink fountain. 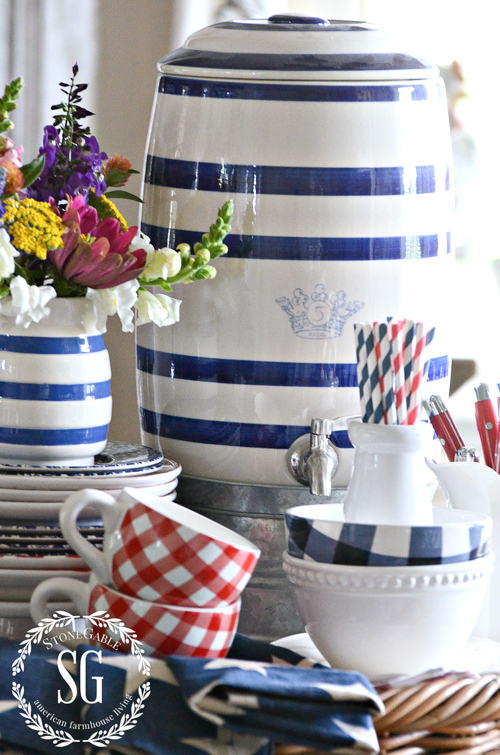 I love how you accessorize with your dish sets, and would love to know how many sets you have? Do you sometimes buy a set of plates (dinner or lunch size) without buying a whole set? Storage to me seems like an issue, and I have to be able to see what I have, so I remember to use them! Love your shop your home idea too! Hi Anita, Great questions! I don’t buy sets. I like to mix and match. And will buy just 2 or 3 dishes that are the same. I often use those dishes on a table combined with others. I have finally figured it out…..layer & go big! Thanks for always sharing such useable advice. 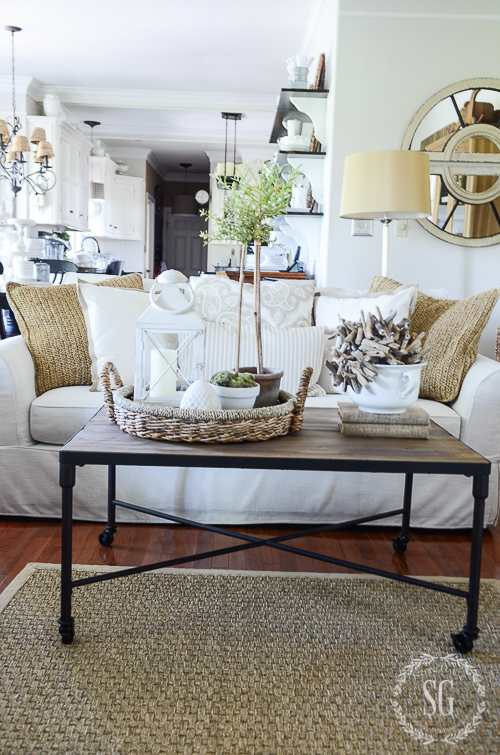 Using things I already own in a big way has changed the look of my home is so many ways! Oh accessorizing is one of my favorite things to do. It seems like every few weeks I’ll move things around and change things up. The effort also helps to keep the clutter down and keep the surfaces cleaner. 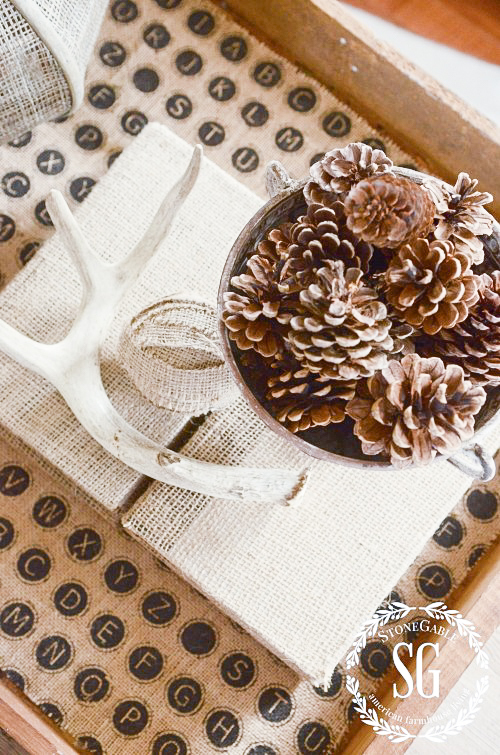 I use the holidays to add lattice more color and whimsy to the decor. I really enjoyed your post. I loath clutter and often keep items I love in storage because I am too cautious. Your article has inspired me to bring treasure out from the cupboard. So glad to hear that Leanna! Use your beautiful things! Thanks for another great post! I love how you break down the essential steps in all of your posts helping all of us to tap into our own creative vein. Layering has been the foundation to improving so many of my projects and your tips have been the key that unlocked that door! Thanks again!! Recently, I’ve been eliminating “layers” to keep a Classic streamlined appeal! I, too, enjoy changing accessories for the Season or a Holiday within my home! I l o v e playing with dishes in my built~in cupboard! Another area I adore to enhance is our large Entertainment Center! 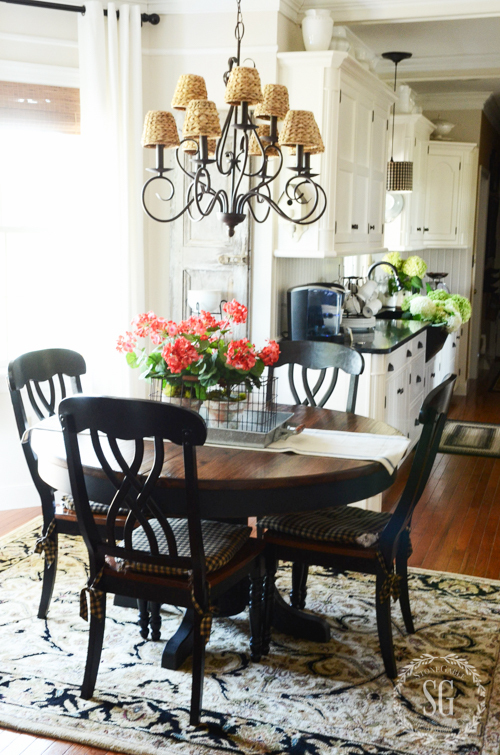 Thanks for sharing your amazing creative decor ideas with us. . .keep ’em coming! Really enjoyed your post today. Since I lack the confidence to display accessory items in a creative or appealing way, I resort to storing many items in the back of my closets until I find just the “right” place for them to be seen. Of course the “right” place never materializes. You approached decorating in a very analytical way today and I think I am able to zero in on correct scale and layering as my problem. With new found information and confidence, I’m off to try some new arrangements today. This has been great — just like going to therapy. I so appreciate this post! It is so true that too many little things look like clutter. Just because you have it, doesn’t mean you should use it. Something I have to repeat to myself all the time. Stepping away really does help. I also take a picture. For some reason looking at a still photo helps. It presents the room from a different view. Also, grouped items look better in odd numbers. 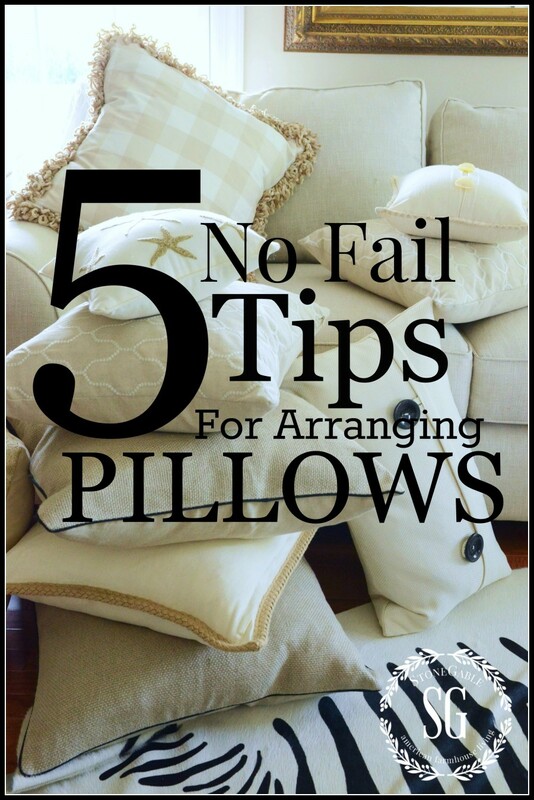 Pillows, pillows, pillows…….certainly something I am lacking!! I find that Christmas is the biggest challenge. My “everyday” pillows do not work well with my holiday decor. Great pillows…..that’s where I need to invest time and money, for sure! I’m right with Judy and her dilemma of where to keep all of my items for changing out. It might be helpful to hear how you store your things, Yvonne. Thank you for sharing these useful tips! I would appreciate a post with some of your ideas about how to properly store, or let me say, where in the world to store, all of these items. I have a large home, with a great storage area, but I’m feeling like a hoarder. It’s easy to amass so many Christmas decorations, other season specific decor, dishes, crystal, vases, and on and on. I only keep what I love, but I still have so much. From your pictures, it’s apparent that you have multiples of pillows, bedding, ,linens, dishes, and even furniture items which you change out. It’s a dilemma for me to know where to keep it, in a way where it is still accessible. I too love accessorizing a home. I think it’s my favorite part. It is like the frosting on the cake. Accessories can give a home such a warm and inviting appearance and tell about who lives there. Hi Yvonne – you hit on my favorite subject! I’m just like you; I love adding those interesting pieces that complete a room and am constantly assessing a room ensuring I don’t have it too busy or too bland. My problem now, unfortunately, is storage – storage for all my decor items that aren’t currently in use. I now live in a condo so no more basement “warehouse”!! Ha! 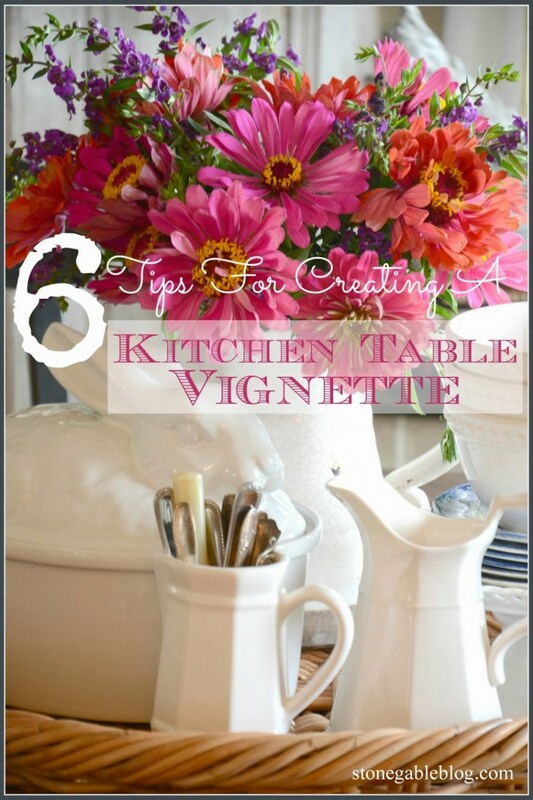 I do have one question that I hope you have time to answer and that is: when you have a nice vignette on the kitchen (or dining room) table and suddenly company arrives and you see the arrangement is too tall to see your guests when they are seated at the table, what do you do? Your arrangement with the blue/white canister looks fairly tall. If it is, do you dismantle the entire vignette? By the way, your photographs are so well done and professional looking! Hi Elaine, What a great question! When I need to use the table I take the whole vignette off in one piece. The basket the kitchen vignette is in is very sturdy and has big handles. I just grab it by the handles and put it on the island. If I have flowers or candles or lanterns in the vignette (and I usually do) I might take them out and put them on the table for everyone to enjoy. Hope this helps. Love, love, love your ‘Get the Look’ feature! So much fun to look at items! Hi Kym, so glad you like it! One of the biggest questions here at StoneGable is “where did you get fill-in-the-blank”. I’m trying to find the exact products or one’s very similar! Thanks so much for letting me know! I love your style,I think your budget must be limitless!!! I too love the get the look feature! You have been such an inspiration to me Yvonne to keep working at creating a beautiful life giving home for my family and all who enter. Keep doing what you’re doing. You are making a difference! Hugs!